Hit the Ground Running: 'Soup'er Hero "5k"
Let me start by saying that this 5k was actually 4.3k (2.66 miles), so my "23:53" finishing time is impressive, but not that impressive. This was a first annual race, so I'm giving them a pass on the short course. 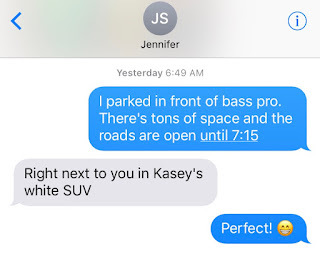 I arrived at GCTC around 6:50 and texted Jenn to let her know I had arrived, and it turned out I had parked right next to her! We already had our bibs because Ashley had picked up everyone's early and delivered them to school. 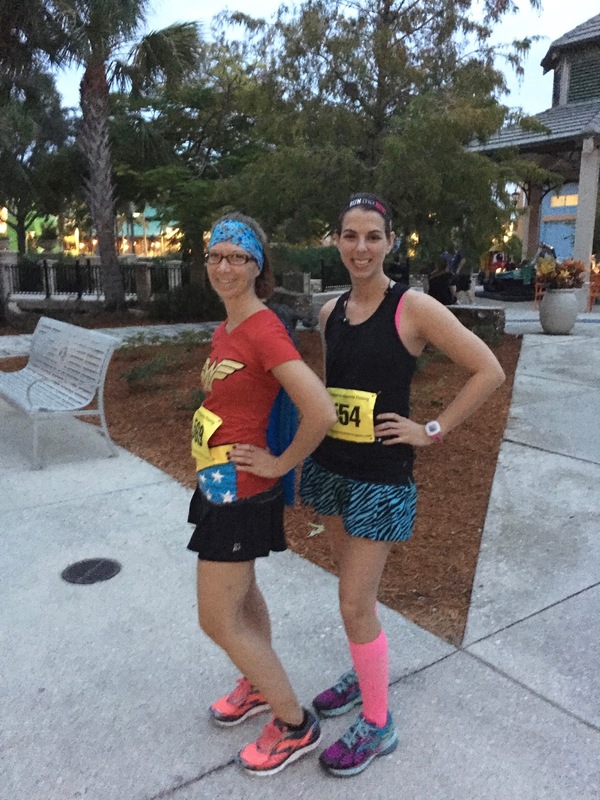 There were a whole bunch of us teachers running: Jenn, Tubbs, Ashley, Kasey, Michelle, and Shelagh. 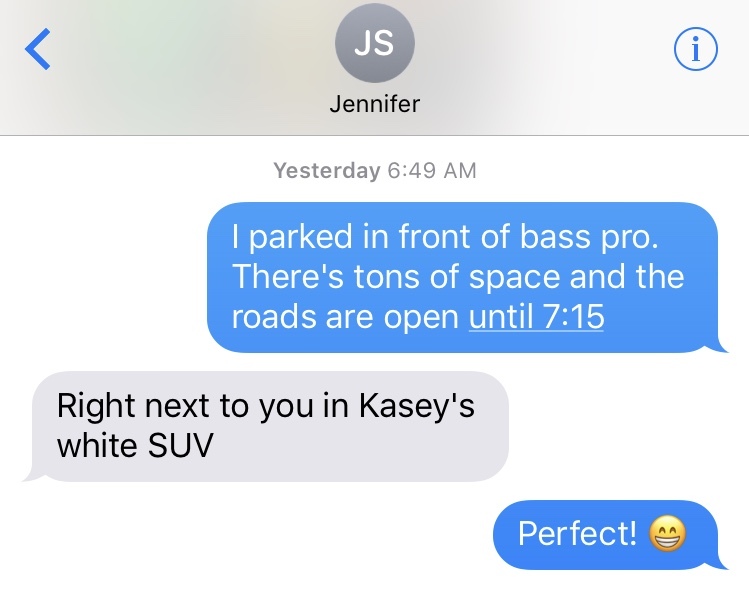 Kasey, Jenn and I made our way to the staging area and the bathrooms, where we ran into everyone else. We hung out and took some pre-race photos until it was time to start. All of us! Hero teachers! Shelagh photobombed my pre-race lineup pic! 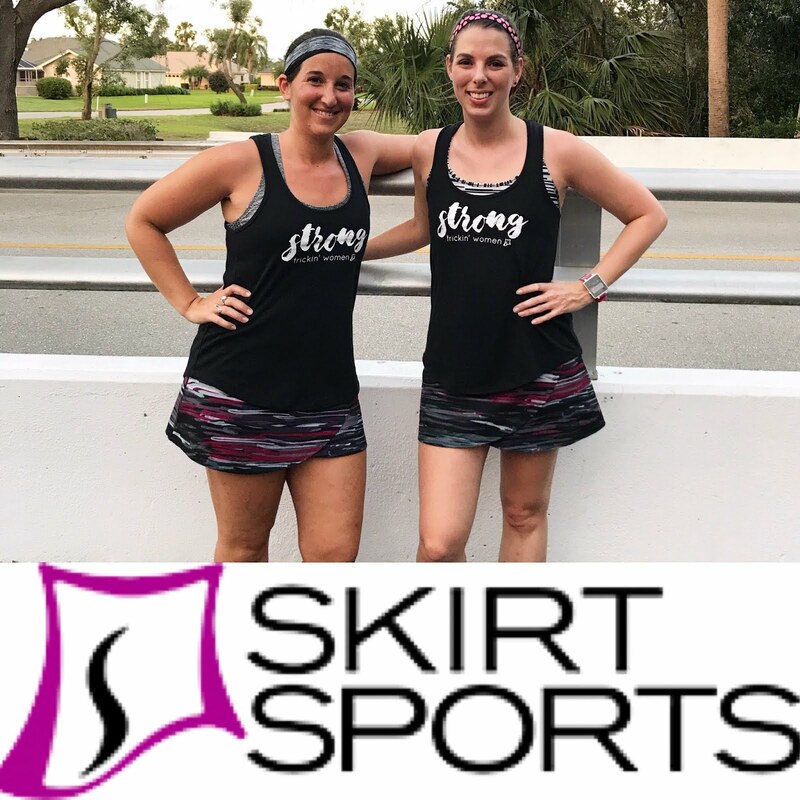 Michelle and I were both in our lioness skirts! After the race she told me she was buying it in the Safari print. I don't blame her; it's so cute. Because this race was fairly small, I ended up starting right at the very front of the line! Talk about nerve-wracking. Luckily, that didn't last long. Within the first few seconds of the race, a handful of people had passed me and I was able to let up on the pedal a bit and find a good cruising pace. Can you spot me awkwardly waving at the cameraman? I hadn't run in over a week and was a bit worried about my stamina for this race, but everything felt good. The day was cool (73) and overcast. There was some gusty wind that made it hard to breathe at some points, but mostly I felt good. The course took us weaving through an outdoor mall's parking lot, and while I ran up one of the lanes around mile 1.5, I caught sight of Jenn, Kasey, and Tubbs. I shouted at them but they didn't hear. Around mile 2, I could see the finish on the other end of the parking lot and knew the course would be short, but I wasn't sure how short. I'm not sure at what point in the race this was, but I look like a confused T-Rex. 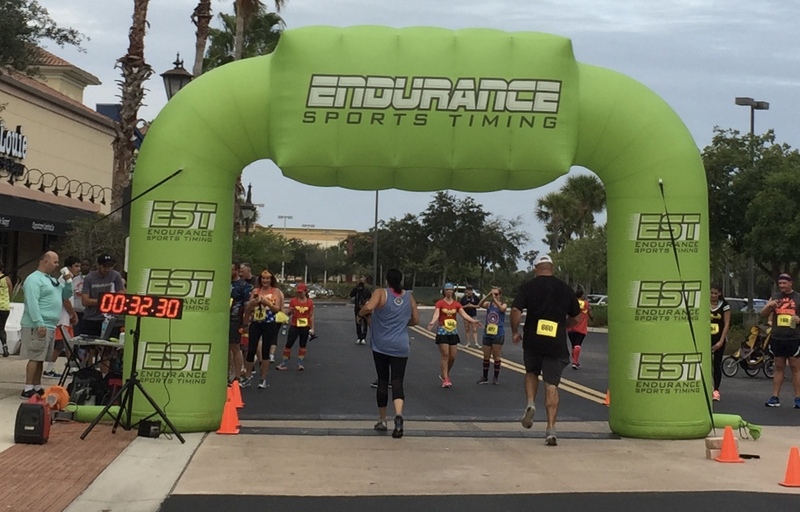 At that point, I began to feel my pace waning, but I knew I was still toward the front and wanted to try to keep pushing it. Around mile 2.4, Shelagh caught up with me (she'd been running with her daughter) and passed me. Then her daughter did. I finished just behind her. I got a water then headed back onto the course to find the others. I found Jenn and Kasey just where Shelagh had first passed me, and I ran with them back to the finish and peeled off in time to get finishing pictures for them. Then, I went back and found Ashley, Michelle, and Tubbs. Tubbs crossing the line while Ashley and Michelle cheer on the other side! Shelagh's daughter had followed back out onto the course, and she called to Tubbs to "run with her heart" and that seemed to really perk her up. After the race, we hung out to see results and bask in our accomplishments. I ran into Mari, who you may remember from Ragnar and various other races. 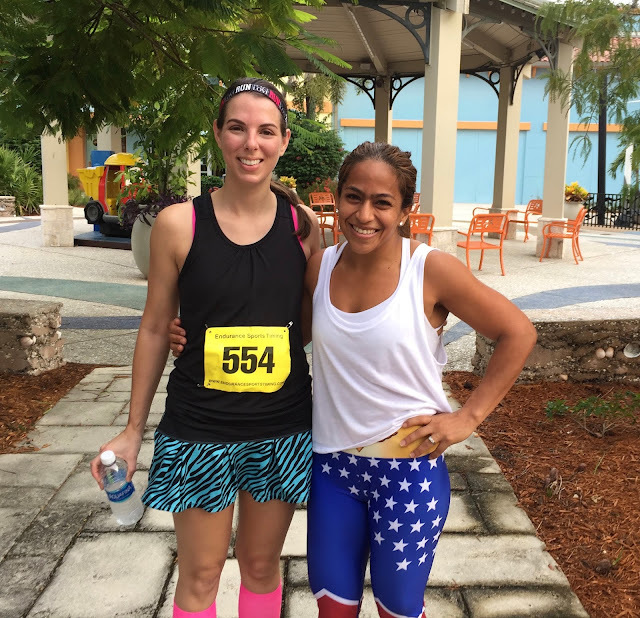 I saw her at Sanibel, too, and it's been nice to bump into her at races lately. Mari led the race for a little while; she ended up placing 4th in our AG. Shelagh placed first in her AG, and her daughter placed second in hers! I placed 8/43 AG and 21/168 OA. For a race that was short and that I ran for fun after some time off, I'm perfectly happy with that. My splits. I've officially given up on Nike+ and am getting used to wearing my Forerunner and using GarminConnect. It was such an awesome experience to run this race with so many teacher friends, three of whom had never run a race before. They were really proud of themselves and so ready to find another! I was disappointed with the short course, but overjoyed with the experience and atmosphere. If they fix the course next year to make it a real 5k, I'll probably be back. Have you ever dressed in a costume for a race? Do short courses bother you? Congrats to EVERYONE! That's so awesome that your teacher friends are excited to find another race! I don't mind short races if I know in advance there is a chance it will be short because the course isn't timed or something like that. It's definitely frustrating if you're gunning for a PR and realize halfway through the course is going to be short (especially if you paid a lot for the race)! Hopefully next year this race will figure out their logistics :). 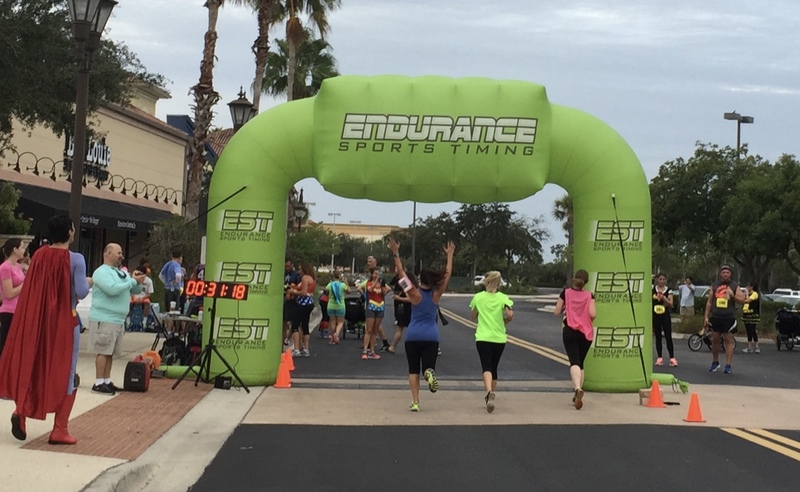 It looks like a really fun race and I think it's cool that you ran with your coworkers/friends. Bummer that the course was short, in any event you did a great job! Awesome! Congrats! I've never heard of a course being that short. That's significantly short, and I'm surprised they could still promote it as a 5K. I've never ran a race with a short course. I usually run longer but blame it on myself not running the tangents. As you know, short courses ANNOY THE LIVING DAYLIGHTS OUT OF ME!!!!!!!!!!!!!!!!!!!! You don't seem mad about it, so I will be very mad about it for you! I'm glad you had fun with all of your teacher friends! I ran in a costume once but it wasn't for a race. 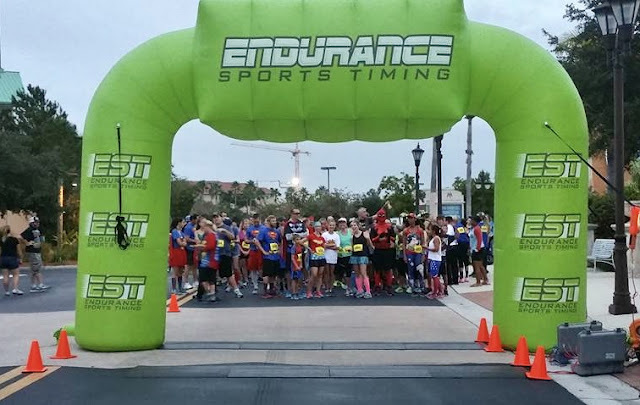 I don't get too flustered over incorrect courses if it's a shorter distance - race organizers are human, they make mistakes, life goes on, run another 5K/10K/whatever. But if it's a marathon that's bad. Can you imagine putting in all that training and work for your first marathon only to cross the finish line and still not be a marathoner? Yikes. Also, I can't help but wonder how a course could possibly be THAT far off, especially with the availability of MapMyRun and other tools for any Joe Schmoe to plan out a course. Did they just eyeball it or what? .5 in a 5K is a huge margin of error. That is so great you had some first time racers run the course! You ran some great splits! and yes, that is a very cute skirt. I don't mind a short course if I am running for fun. They really were off though, they need to fix it! I have run a short course before and I was flipping annoyed because i was going for my PR!!! Other than the short course, it sounds like a fun race! 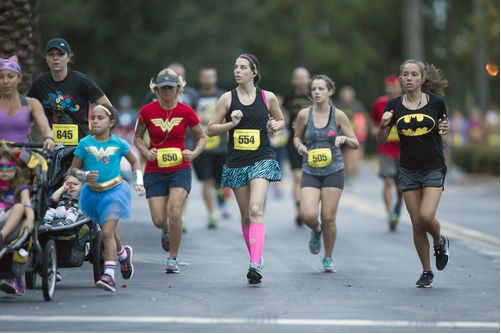 I love superhero themed races! Great time! I have worn costumes to a few races, if I had the time, I would do it more often. A Thought on Race Goals and Chattajack!